Located between Medina and Wayne County, Rittman, OH, is a small, tight-knit community with the youth at the center of its pride and excellence. In July 2011, MW Metals from Whitmore Lake, MI, was contracted to install 92,000 square feet of FiberTite® Simulated Metal Roofing on the Rittman Middle/High School. 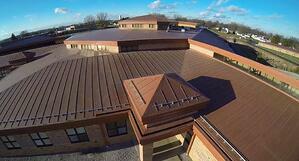 The roofing membrane products exceeded expectations of district faculty and the surrounding community. “It was an easy decision for our board to use FiberTite as the roofing material as opposed to metal,” said Doug Stuart, active School Board President of Rittman Exempted Schools. Stuart, a UPS Driver in the community and former President of the Ohio School Boards Association, is heavily involved in the livelihood of Rittman students and has three children of his own attending the school. He stressed the importance of having a safe, reliable roof that both protects and looks aesthetically pleasing. “We are very impressed with the performance of the roofing materials, the sound deadening, the cost savings…,” said Stuart. Although under the same roof, Rittman Middle/High School, grades 6-12, are separated into adjacent wings of the school and connected through a cafeteria and gymnasium, referred to as the Common Ground. The recreation center, elementary school and middle/high school create a campus effect, unique to other surrounding school districts. When the middle/high school was constructed nearly four years ago, the school board met to strategize cost savings initiatives. After applying to the Ohio School Facilities Commission for funding, the school was granted more than $10 million in addition to earning a Silver Award for its sustainability efforts. The Board was able to save more than $200,000 to reallocate back to the students’ education and taxpayers’ money. The FiberTite Roofing System on Rittman schools is still performing seamlessly today and Board members are continuing to witness the return on investment. With more than 1,000 students under one roof, it is essential to have a roofing system you can rely on—that is why Rittman School District trusts FiberTite for peace of mind. Seaman Corporation, manufacturer of FiberTite® Roofing Systems, has been a worldwide market leader of innovative, high-performance coated fabrics since 1949. Using a unique, four-layer technology providing puncture, UV, chemical and ponding water resistance, FiberTite is the original Elvaloy Ketone Ethylene Ester (KEE) membrane with a 35+ year history of performance.